Siamese cables give you the power to centralize your video and power distribution for your CCTV systems, and allows for more flexible placement of your security cameras. RG59 has long been the standard for video distribution cabling that is both affordable and reliable. 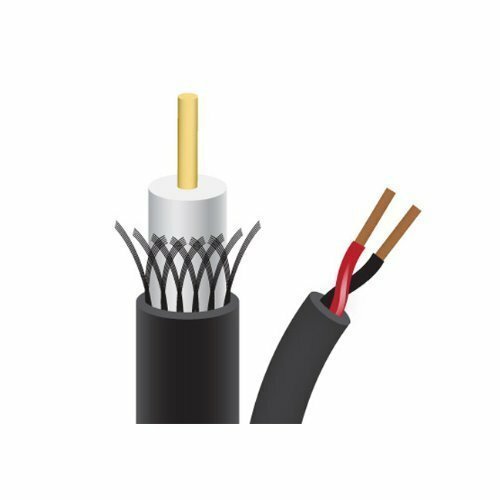 The 75 ohm RG59 coaxial cable consists of a center conductor, dielectric and two forms of shielding, an aluminum foil shield and a 95% braided wire shielding to protect your signal from EMI. Our RG59 cables are coupled with stranded 18 gauge power cables. Combined with our BNC connectors, power terminal pigtail, and compression tool, this will give you rock-solid connections for flexible and reliable installations throughout your building. The 1,000 foot cables come on a wooden spool marked at every foot, perfect for pulling on its own or loading onto your cable tree.